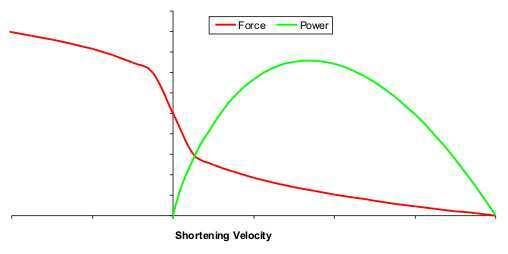 Figure 1 shows the muscle force and power vs contraction velocity. It’s a very important graph because it marks where classical mechanics stops and exercise physiology starts. Note that the graph is idealized, with no absolute values on the axis. Each athlete will have a slightly different graph, which will probably also change as a result of training. Even the position of the peak vs maximum contraction speed depends on the person. So what’s the impact on the gearing or rigging parameters of your boat? Suppose we want the rower to achieve his maximum power at each stroke at a given stroke rate, let’s say at mid-drive. We can then calculate the rower’s velocity (relative to the hull) at mid-drive and estimate the duration of the stroke, for a given length on the slide. Then we have to adjust the gearing such that leg force needed to achieve this speed equals the maximum force from the rowers force-contraction velocity graph. Finally, we could put into the calculation our ideal catch angle and voilà, we can determine span, inboard, scull length, and through-the-work setting. I believe this is what Dr. Kleshnev is using in his rowing speed and rigging chart. So how do you know how your power-contraction velocity graph looks? I guess there are three ways. The first one would be to design some direct measurements. A simple home setup could be on the rowing ergometer using different ratings and drag factors, trying to achieve maximum speed at a given time interval and recording stroke/recovery ratio and displayed average power. The second method would be to rely on intuition and set the rigging parameters such that the rower feels comfortable to achieve his ideal stroke rate rowing at “race power”. The last method would be to do on-the-water boat speed measurements at different rigging parameters and ratings. 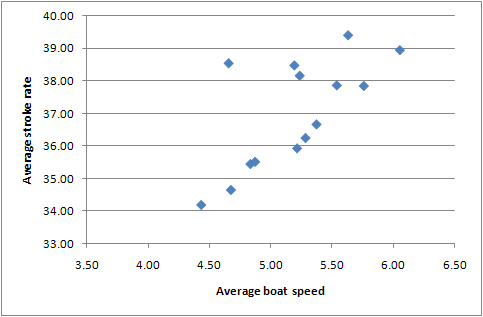 Figure 2 shows the stroke rate vs boat speed for my favourite data set, the Lucerne World Cup 2010 Sunday Finals races. Clearly, there is a trend of increasing rating with increasing speed, where the Men’s eight rows at 39 spm and the women single winner rows at 34spm. There are, however, also a few outliers, most notably the women 2- at 38.54 spm and 4.7 m/s. Either they used a lighter gearing or they rowed a shorter stroke. I presume most coaches use quite conventional rigging parameters, which means there will not be a lot of variation between them. As these experienced crews know how fast they go and at which power they need to row to not burn out before reaching the finish line, they intuitively select an appropriate rating corresponding to their “ideal race power”. Final question: Is it really necessary that the crew rows close to its optimum muscle contraction speed? If not, then rigging optimization really boils down to setting it to what “feels good for the crew”, or engage in time-consuming on-the-water trials, and hoping we can ignore other factors such as varying weather conditions, rowing technique, psychological factors, nutrition, cheating and what else? This entry was posted in exercise physiology, rowing physics on July 26, 2010 by sanderroosendaal. Using force curves measured at different drag rates on a rowing machine could determine the optimal drag (the force curve with highest power). The point of optimal drag is equivalent the point of optimal contraction speed. This would be a better method since changes in stroke rate encompass more then changes in contraction speed. It is very well possible that a higher stroke rate is related to a less powerful drive but still results in higher speed. A more natural way (although you’d have to adjust the rowing machine) is to keep the drag constant and adjust the cog size (like on the concept B). This would be more similar to adjusting the resistance (e.g. by oar size) while staying in the same boat class (meaning constant drag). Martijn, do you know if the newer Concept models allow detailed analysis of force curves? Can you export the data to a computer? I tried to row at different drags on my model C but I can only read average power, and have no accurate measurement of stroke/recovery ratio. I think you are spot-on with your remarks on rowing at different drags. There is reasonably cheap software available for the concept machines. In case you are using linux I could provide you with my alpha version of an analysis program for the concept. I am using Linux (Ubuntu). Are you sure there is a way to extract data from a model C? That would be exiting.